Wael Shawky continues his exploration and interrogation of historical narratives in The Song of Roland: The Arabic Version (2017). 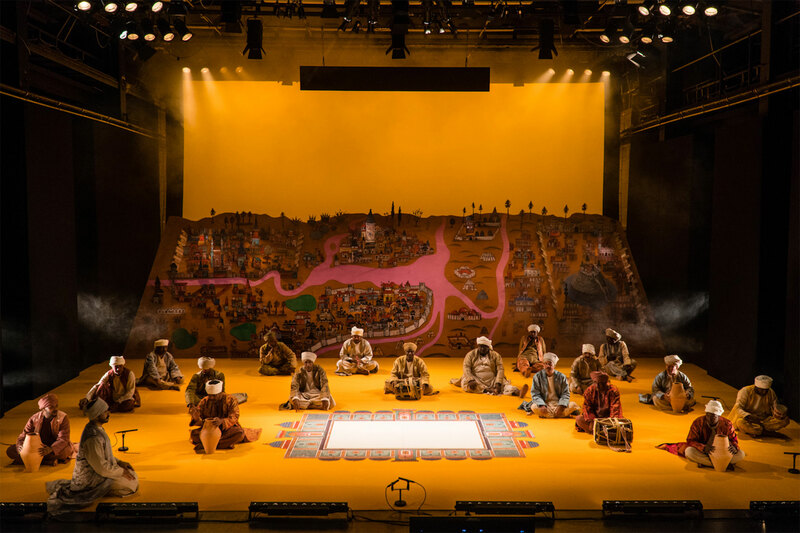 Wael Shawky continues his exploration and interrogation of historical narratives in The Song of Roland: The Arabic Version (2017), a large-scale musical and theatrical performance that will premiere at the Theater der Welt 2017 festival. The performance is based on the French epic poem La Chanson de Roland, which has been translated into classical Arabic and will be brought to life by over 20 fidjeri singers and musicians performing in the traditional style of Arabian Gulf pearl divers. Shawky’s performance brings together two rich but disparate traditions of narrative verse. He draws on a major work of eleventh-century French literature, written in the time of Charlemagne, which glorifies the emperor’s reign and conquests along with his nephew Roland’s heroic war against the Saracens (a term used to describe Muslim Arabs). The translation and adaptation of this text into classical Arabic is set to fidjeri music, which has its roots in the Arabian Gulf and dates back more than 800 years. The fidjeri singers, famed for their expressive solos and call-and-response choral performances, are accompanied by percussion instruments and maritime-inspired choreography. In addition to co-producing the performance, Sharjah Art Foundation has contributed substantial support to Shawky’s residency project and managed the logistical coordination for all rehearsals, which are taking place in Sharjah and Bahrain. The artist is also working closely with SAF to produce period-inspired linen and silk costuming that incorporates sherwal and jalabiya elements. SAF’s graphic designers are also developing scenography, drawing on miniature paintings and medieval maps of cities such as Aleppo, Damascus and Istanbul. The Song of Roland builds on a number of major projects by Shawky, including Cabaret Crusades, the landmark film trilogy comprising The Horror Show Files (2010), The Path to Cairo (2012) and The Secrets of Karbala (2015), in part supported by SAF, as well as the artist’s performance Dictums 10:120, commissioned for Sharjah Biennial 11 (2013), which was developed through a series of workshops engaging members of SAF’s production team. Produced by Kampnagel Hamburg; co-produced by Theater der Welt Festival 2017, Sharjah Art Foundation, Holland Festival, Onassis Cultural Centre Athens and Theaterspektakel Zürich. Funded by the Federal Agency for Civic Education, Germany. 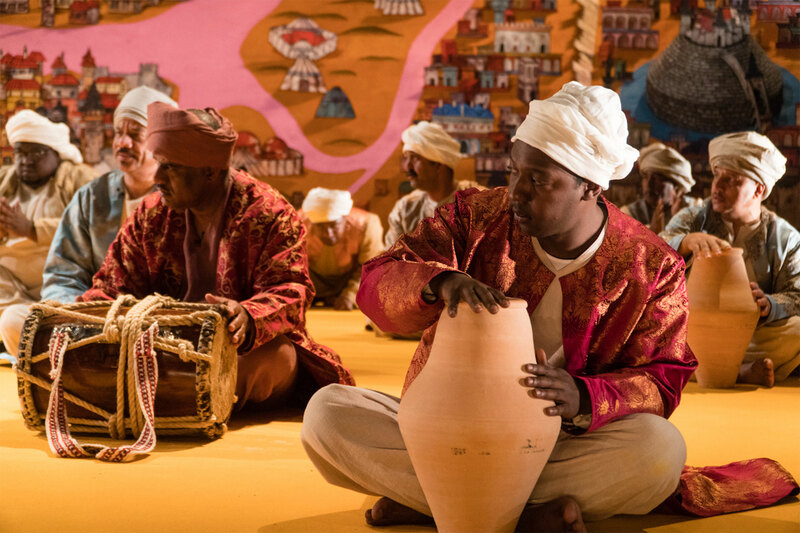 In photographs, installations, videos and performances, Wael Shawky mines traditions of entertainment and performance through multilayered historical reconstructions.